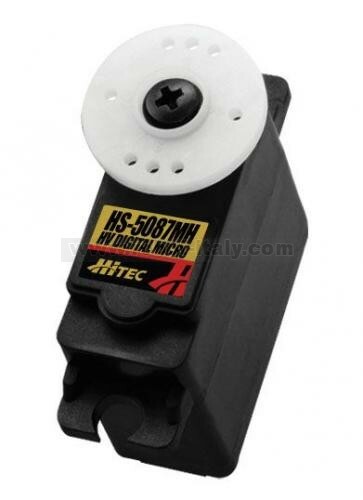 The HS-5087MH digital, metal gear micro servo is the high voltage version of our ever popular HS-5085MG. Built with a 3-pole ferrite motor and heavy-duty metal gears, this servo will bring maximum performance to your hobby and deliver extra power with a 2-cell 7.4V LiPo battery. Whether you are a beginner or an expert in the RC field, our HS-5087MH will provide the strength and capability you need and want in a micro servo. 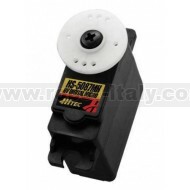 Drivers will find it the perfect steering servo for their 1/16th scale vehicles. Pilots with .15 to .40-size glow and electric aircraft will relish in its power and reliability. Its precision and performance also make it perfect for 500-size helicopters.